In the perfect world, businesses can anticipate the needs of their customers early on in their interactions and avoid issues like complaints. Unfortunately, we don’t live in a perfect world, so optimizing the customer experience remains a huge challenge. The price for failing this challenge is a number of unwanted outcomes such as undermined image and customer loyalty. Despite this, many marketers and business leaders are ignoring or downgrading the importance of working with customers before and after the sale. Yes, the fact that a customer came to your company and bought something doesn’t mean that your product is great in alleviating a problem that the customer has. One of the main reasons why they fail to acknowledge the importance of anticipating customer needs is a lack of a deep understanding of the target audience. That’s why many brands focus on a product more than the customer problem that product helps to solve. Clearly, the correct strategy requires making decisions based on solving problems and meeting the needs, because it leads to a better customer experience. For example, hospitals are a great example of how an organization focuses on client experience because they ensure that patient stay is comfortable during the treatment period. So, having a broad understanding of your customers is the most important task needed to accomplish core business goals. Whether you’re attempting to improve sales, increase customer base, or find ways to produce a more engagement content, knowing the needs of the target audience is key. 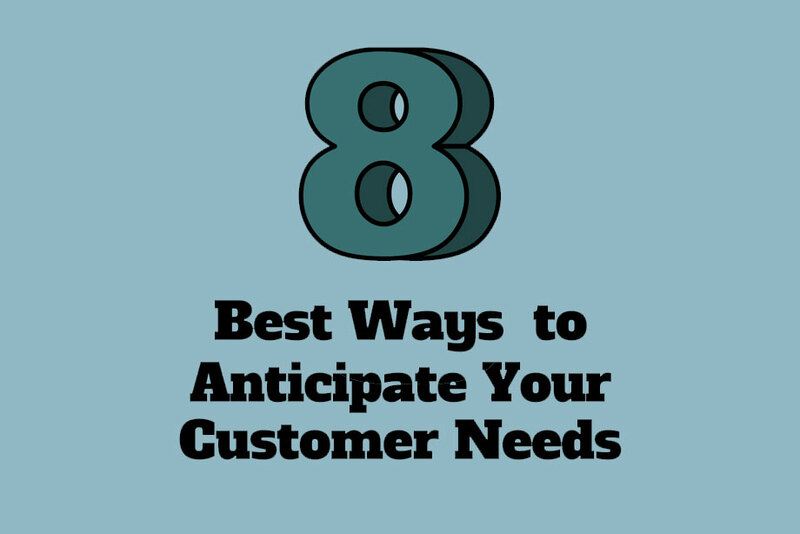 In the infographic below, we have described 8 ways to anticipate the needs of your customers. Each way provides a strategy for getting to know them better before, during, and after the sale to ensure that a product/service is useful and all issues are taken into consideration. You may also like: How to Make Your Website More Interactive for Visitors? These ways are both common and unique techniques meant to inform and inspire your customer engagement effort so you know what is needed by your target audience. For example, the “try before you buy” technique is a practice used by 44 percent of companies because many people prefer to see whether the product can meet their needs before they pay for it. Read about other techniques below and make sure that you’re making the most of your relationships with customers. And remember: you’re going to win only when you’re providing valuable personalized experience, and creating it requires to attaining a view from the customer’s perspective. This infographic is submitted by Lucy Benton. She is a marketing specialist, business consultant and helps people to turn their dreams into the profitable business. Now she is writing for marketing and business resources. Also, Lucy has her own blog Prowritingpartner.com where you can check her last publications. If you’re interested in working with Lucy, you can find her on  Twitter.